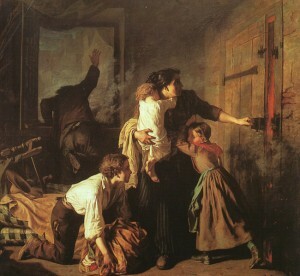 “The Fire,” painted by Alexandre Antigna 1850-51. Le musée des beaux-arts d’Orléans. As you will rather expect to hear from me tomorrow evening, and as also events occurring around me since I left you enable me to scribble off a long & interesting letter, I will devote an hour or so today to the pleasant task of preparing such an one for you. I arrived safely at the Ocean House about 2 oclock yesterday …. Soon after 10 I took a glass of hot whiskey punch after getting in bed, had two extra blankets put on my bed & settled away for a sound & hot sleep to melt away my very bad cold; But only half of the remedy, as it turned out, was to be applied. Very soon after midnight the cry of fire waked me from my nap & I found myself in a profuse perspiration – a man running past under my window (I in the 3rd story,) was asked where is the fire, and he answered in foreign accent, our inginous – next door – so I thought his engine house was in the direction of his race, & pulled the covering closer around me. 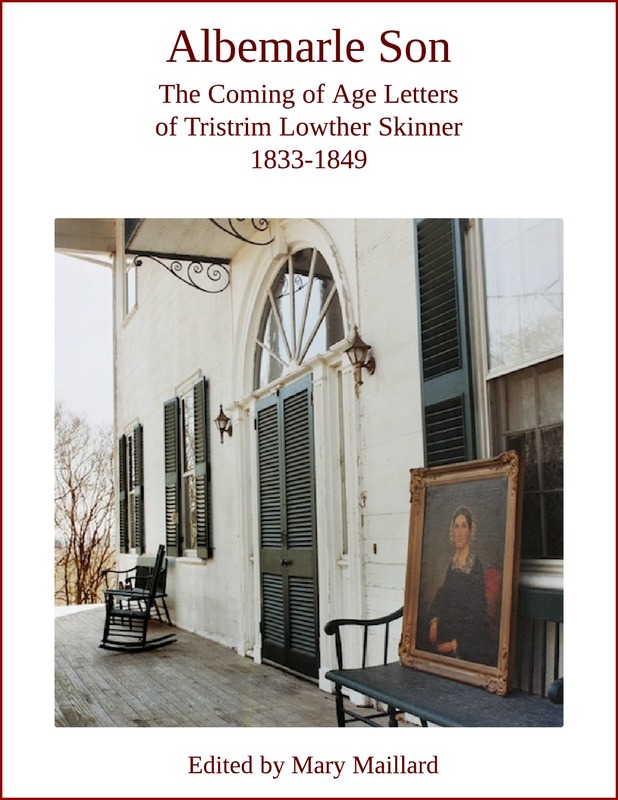 Skinner was a guest at Ocean House, constructed in Portsmouth, Virginia, from 1853-1855. Drawing from Robert W. Lamb, Our Twin Cities of the nineteenth century: Norfolk and Portsmouth, 1887. Detail from Tristrim Skinner’s letter showing the location of his room in the hotel. Skinner Family Papers, Wilson Library, University of North Carolina, Chapel Hill, N.C. The wind was N.W. but not strong, & it was quite cold. 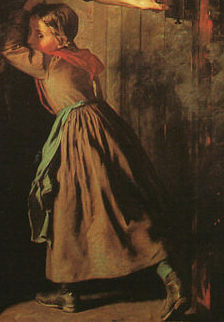 The wind tended to drive the fire directly into the centre of our house, but as the dense smoke preceded the flame, & the people of our house thoughtlessly opened the doors leading to the yard, a volume of black, choking, smoke forced its way up the staircase as though it had been a great chimney. Seeing that volume of smoke fill the passage on which I was I thought I would move lower; so I took my luggage in my hand & approached the head of the stairs. There I found a scene which reminded me of the description we read of the burning of a hotel in a western city last year in which so many were killed by burning or smothering. From what I knew of the location of the fire I knew we were in no danger from the flames at that time, and had made no calculation for the smothering. The stairway was crowded with men women & children – trunks boxes bags and favorite pieces of light furniture which families occupying the 4th story were endeavoring to save. The smoke was so suffocating as to blind us all, & to exhaust those who unaccustomed to exertion were tugging at heavy baggage. I formed my plan at once which was to reach the bottom of the first flight of steps, & in so doing to make a way for persons to pass the trunks which blocked up the passway. This I did almost immediately though with a good deal of exertion, by pushing & pulling out of the way what obstructed one side. a crowd followed me rapidly till we reached the next stairway & that I found very fortunately was not jammed, for the momentary stoppage above had enabled persons to clear that flight of the baggage. This last flight led to the street level & though the smoke was even more dense than above being able to pass rapidly no one fell. The crowd above came down so rapidly after me that the baggage pullers had room to work & the difficulty ceased. Just then too the opening to the roof was opened, & the flame becoming more bright, the volume of smoke diminished & what had accumulated in the house passed off through the roof. A lady as I passed down at one time, was pulling a trunk & just as I got past, I heard her cry for help saying take this trunk off of me! its mashing me. I looked back & found the poor woman pulling the trunk down stairs had not been able to keep out of its way & it caught her foot on one step, & she could not lift it to release herself—Reaching the bottom another was crying, I’ve left my child in the third story, please get her for me – Afterwards she explained that in her fear that thieves would plunder her room while she came out to see if it was necessary to desert the house she locked her door, when on finding such a volume of smoke & such a rush of persons for the street she followed them, & had descended two flights of stairs before recollecting that her baby was locked in her room. Capt Burbage had his wife & child in the third story, & when I first descended I met him trying to ascend in great distress. Meeting me he said—Col: I have saved my wife but don’t know where my child is. 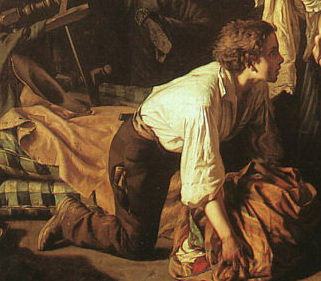 He did succeed in ascending, but missed his child who was in the arms of a nurse descending on the side opposite of him. The girl had been delayed by the crowd but had the sense to get down as soon as she could & found Mrs B. half crazy long before the poor Captn despairing of finding her came back to enjoy his own relief in finding all safe. 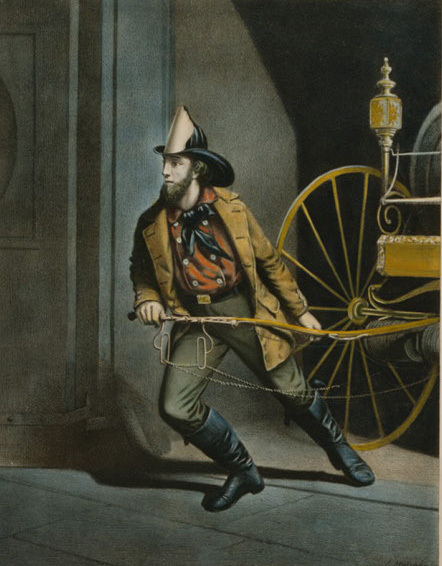 Many were the humorous adventures of the night— At 2 1/2 oclock the flames were supposed to be subdued without their having taken hold upon our house, & persons carried their children & baggage back to their rooms. Some went to bed – The house was then crowded with firemen, guests, & the rabble, these last picking up all they could find unwatched– & the second class trying to watch what was theirs – A general treat followed, & both firemen (though not all of them) & the rabble drank too much, & became quite noisy. Just then it was found that the fire had stolen its way under the tin into the garret of the Ocean House at the corner wh: the wind forced it right into the long line of rooms. The alarm of this being given a new rush for saving baggage & babies followed though with less confusion, as all thought the house would surely be burned. The working crowd being half tipsy & intent on completing the work of becoming completely so, were very slow to recommence work, & there was very great danger of the building being lost. But a few resolute fellows hurried up on the roof & with axes cut holes through it & after a while succeeded in getting a hose pipe up there & commenced playing upon the spreading flames. After the first battle I returned to my room but found it flooded with water dripping from the floor above it. Returning I met Mr Courtwright one of the company first mentioned who had a room at the head of the stairs on the same floor with my room. He told me he had two beds in his room & would be pleased to give me one – I declined however, but asked him to keep my baggage till I should call for it. He went to bed again, but of course had to get up at the time of the second alarm. Between the two battles I walked about the house talking with those I knew, hearing the wonderful adventures each had to narrate, and talking with Captn Burbage’s wife – sister – & other ladies who had assembled in the Parlors – As the fire brightened up again I mounted the roof to watch the operations, for this time knowing that my baggage was safe & that the fire must work downward & of course more slowly than if it were working upward, I was perfectly safe, & could enjoy the excitement which large fires always produce in me. When I found the men had obtained command of the flames, and being pretty well chilled I went down stairs where a position near the fire soon warmed me. 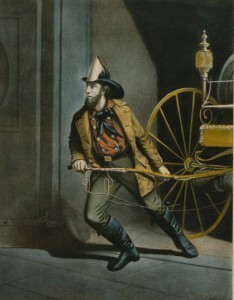 The American Fireman, 1858, Currier & Ives. Library of Congress. 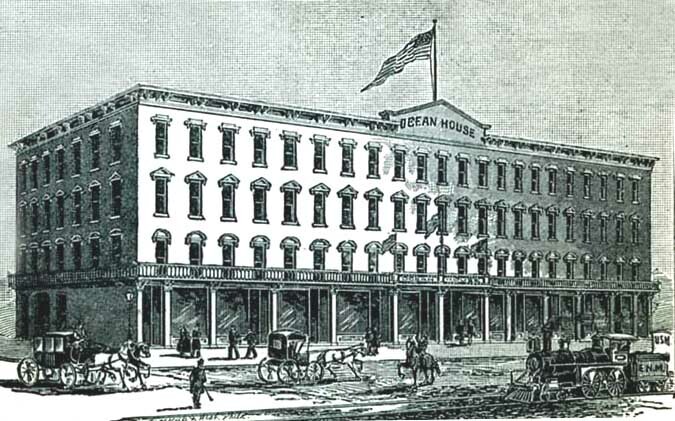 The nearby Macon House Hotel opened in 1855 and stood two blocks from the ferry building where passengers travelled across the Elizabeth River to Norfolk, Virginia. The Portsmouth Literary Hall, New York Times, January 18, 1859. Beginning in 1858, Captain Thomas Irvin Burbage of Franklin, Virginia, skippered the Curlew, the paddle-wheel steamboat that plied the Chowan River from Edenton, N.C. to Franklin. 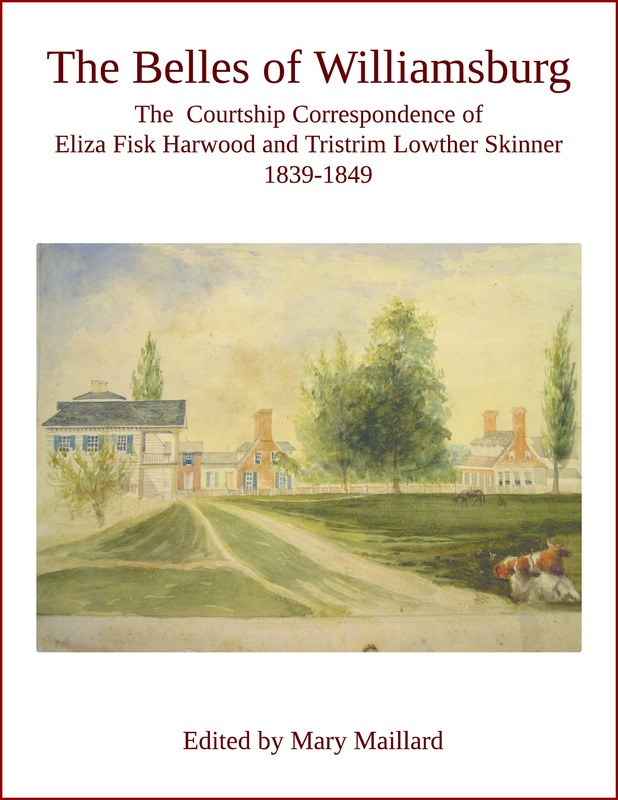 Tristrim Lowther Skinner co-owned the Curlew with his brother-in-law, Thomas D. Warren, and four others. 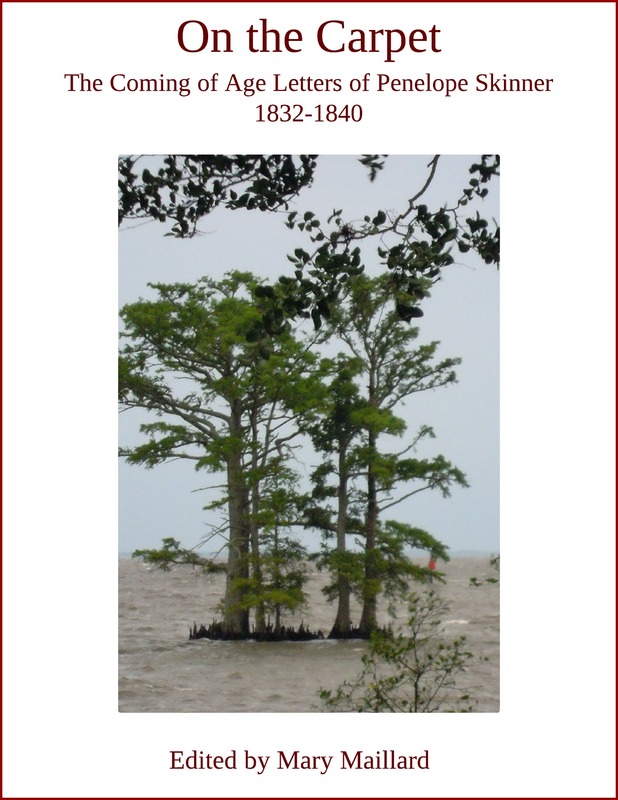 Christopher Olson, An Historical and Archaeological Investigation of the CSS Curlew; Masters Thesis, East Carolina University, Greenville, North Carolina, 1997; wills of Tristrim Lowther Skinner, Skinner Family Papers, Wilson Library, UNC, Chapel Hill. Note: The annotations to this document, and any other modern editorial content, are copyright © Mary Maillard. 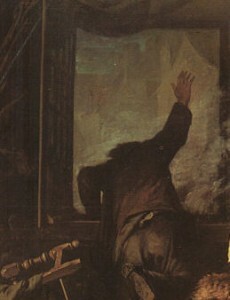 Image of firefighters is a detail from a painting of Captain Thomas Targee who died fighting the great 1849 St. Louis fire, painted by his fellow firefighter Matthew Hastings, Missouri History Museum. All other images are details from Alexandre Antigna’s The Fire, 1850-51, at Le musée des beaux-arts d’Orléans. This letter was published in honor of the International Association of Fire Fighters and International Firefighters Day, May 4, 2015. “Fire Engine Donkey, Union Fire Company,” c.1852, Thomas M. Easterly, Missouri History Museum. 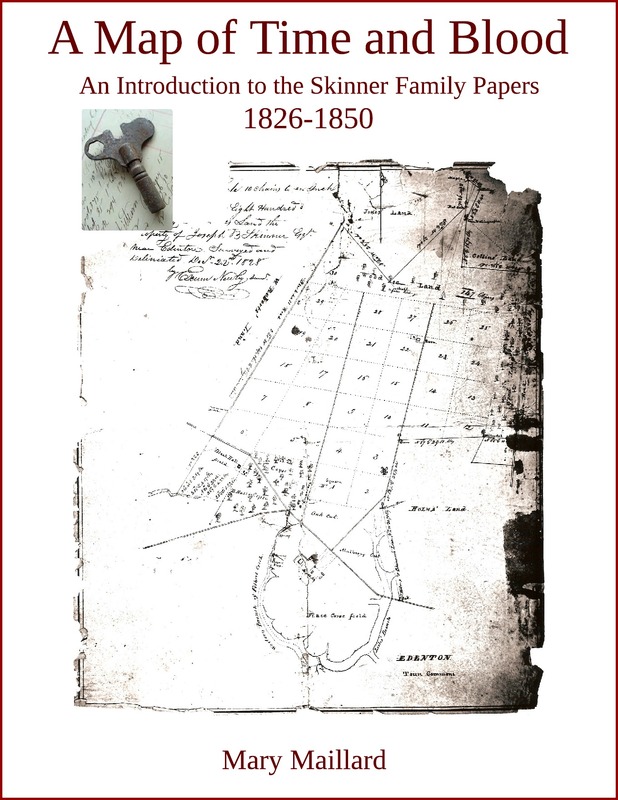 This entry was posted in Uncategorized and tagged 1859 hotel fire, American firefighting history, antebellum firefighters, Captain Burbage, documentary editing, Eliza Fisk Skinner, fire engine history, Internatinal Firefighters Day May 4 2015, International Association of Fire Fighters, Macon House Hotel, Mary Maillard, nineteenth century hotel fire, Ocean House Hotel, Pacific Hotel fire St. Louis 1858, Portsmouth Literary Hall, Portsmouth Virginia, Portsmouth Virginia hotel fire 1859, primary source document, Skinner family Edenton, steamship Curlew, Thomas Irvin Burbage, Tristrim Lowther Skinner. Bookmark the permalink.